This website is about change – change in your life. It’s about moving from one stage in your life to another, whether that stage occurs in your teens, as a young adult, in midlife or beyond. It’s about moving to a new job, new relationship, new state or new part of the world. It’s about new thoughts and new actions. Experiencing this sort of life change involves moving from a place where you are comfortable with the rules and decisions to a place where you aren’t. It’s about moving from your Comfort Zone to your Courage Zone. Your comfort zone is actually a psychological state. A state where you know and understand what is happening, It is the place, people and activities you are familiar with. Your actions in this state do not produce much anxiety or stress when you do them because they are familiar. You feel safe. That does not mean it is that the actions you take are good or bad, just that you know them well. Sometimes something different happens than expected and pushes you out of this comfortable state, but as long as things remain normal, you feel comfortable and safe and you stay in your Comfort Zone. Your courage zone is another psychological state. It is a state where you are not sure of what is happening. You do not know all the people or the activities involved with what you are doing. Your outcomes are uncertain. Your actions produce some level of stress and anxiety. Again, this does not mean that the state is good or bad, just that it is unfamiliar. Here’s the thing. If you want to have change in your life you ABSOLUTELY must move out of your comfort zone. Change, by definition, means to become different, to transform. So creating change in your life means doing, acting and experiencing different things. 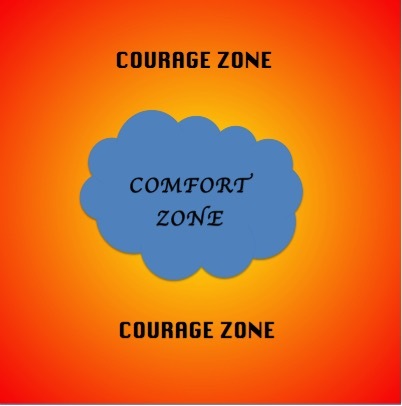 Change cannot happen without stepping out of your Comfort Zone and into your Courage Zone. Change is about some level of fear and uncertainty. Change is not about being fearless; it is about feeling the fear and having the courage to do it anyway. The fantastic thing is that once you step out of your Comfort Zone repeatedly, it begins to grow and expand. The anxiety and stress you feel starts to diminish. What was once uncomfortable becomes more and more comfortable and, viola, your Comfort Zone expands to include the new people, places and activities. So this website is about courage, the courage to do what you want to do and be what you want to be. It is about how your Comfort Zone is limiting you and why you need to step out if it. It is about understanding the process of change and being able to do it. It is about tips, tools and tricks you can use to change even though you fear it. This website explores the process of progressing to a new you, expanding yourself and growing. Like many people, I am going through change in my life and I will be documenting what I already know about change, and what I learn and experience in the process. I hope you will join me in the journey!